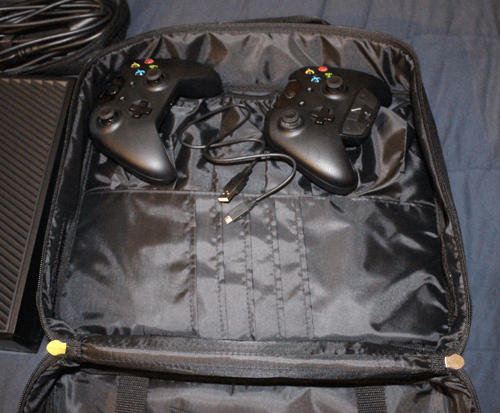 This CTA Digital Xbox One Carrying Case is relatively inexpensive, and works well for the mobile gamer. 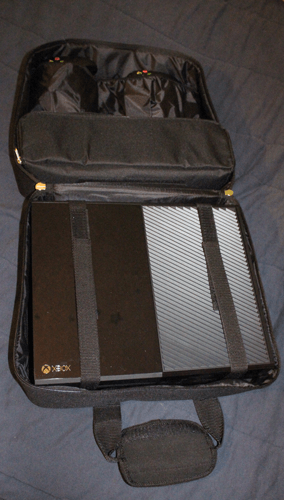 It provides an easy to pack, easy to open solution for people who have to (or want to) bring their Xbox One around from place to place, without having to re-pack up the factory box. The case is made of your average bag fabric, and while it feels like it could be waterproof, I wouldn’t necessarily keep it out in the elements if you’re traveling on foot. Or perhaps maybe hit the outside fabric with a waterproofing spray if you know you’ll be outside a lot. The inside is lined with a thin vinyl material, and on the one I have the seams are all in good order. No frays or tearing and the overall quality of the product is pretty good for the cost. 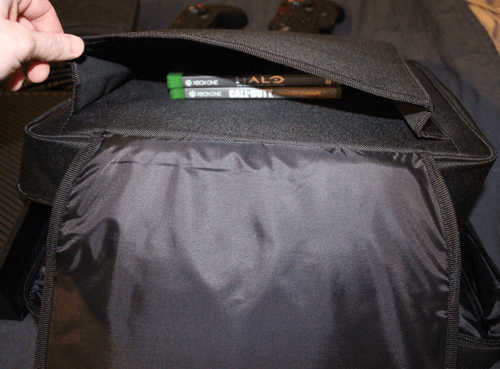 The case zips open/closed in the middle, separating into two halves for your console. One half holds the console in securely with two velcro straps. The other side has two elastic pouches and cd slots to hold your games. I wouldn’t actually store my games inside the disc sleeves, I’d keep them in their cases and just put them in the outside pouch (see photos). The two elastic pouches aren’t the same size, and I wish they were. The smaller pouch just barely fits an xbox controller with some finagling, and the other pouch easily fits with a stereo adapter attached and room to spare. Why they didn’t make them the same size I’ll never know, as it just would’ve been a better design. 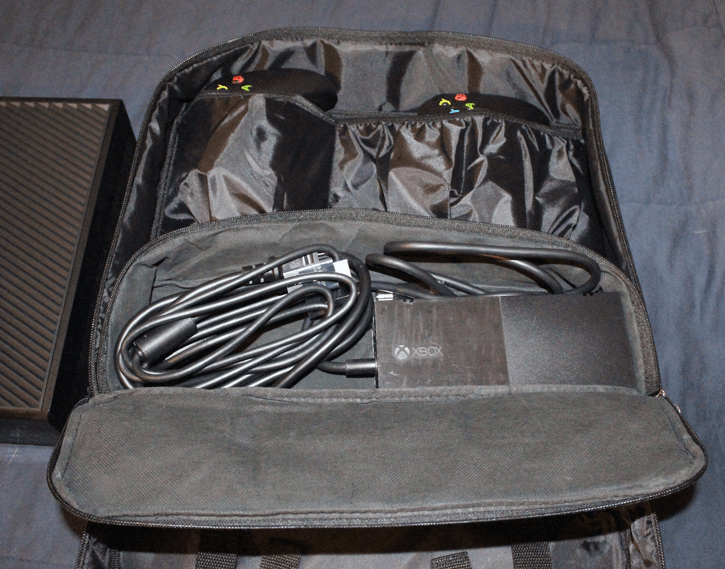 Also on that side is a zippered removable pouch that is meant for the Kinect but actually holds the power brick, power cable and an HDMI cable perfectly. Or you could put the controllers in the zippered pouch but then there isn’t a great place to hold the power brick in place. 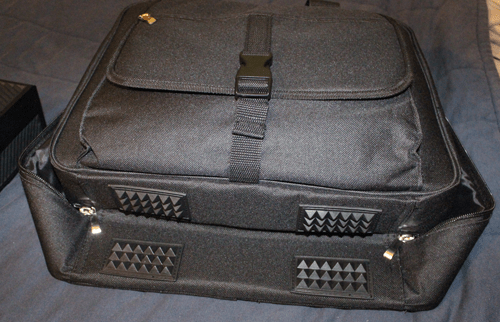 The outside pouch has a buckle clasp and expands slightly to fit a few video games, or whatever else you may need. 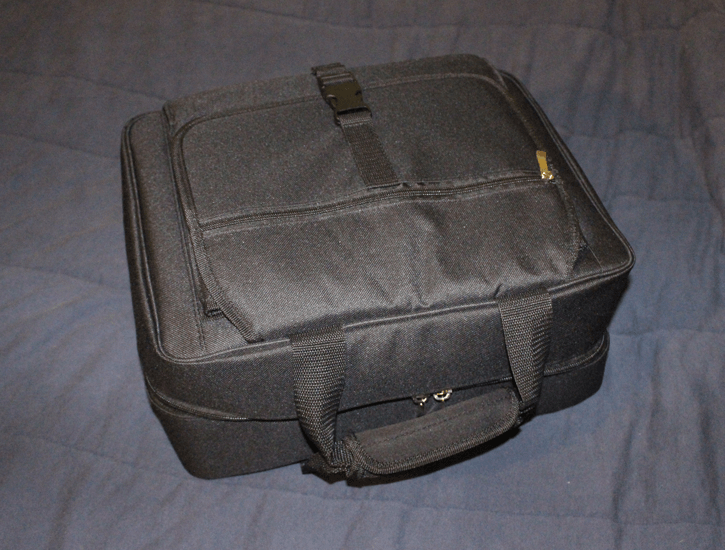 It doesn’t fit my headset, which is currently the only thing (if I have two controllers inside) that doesn’t actually fit in the case. you could probably wedge in the headset or another controller if you wanted, but they’d be against the console without anything in between them. Maybe once or twice it would be okay but prolonged use like that might cause some wear on your Xbox. For what it costs, the case does a good job of holding the console and accessories to move it from place to place. I wouldn’t put it in as checked baggage on a plane, but I wouldn’t be afraid to carry it on the plane, just as long as you put it in the overhead storage after everyone else. It doesn’t have a lot of padding, and you can see in the photo how the case essentially collapses as the exterior sides have no real rigidity without the xbox inside the case. The bottom does have nice rubber points to rest on, keeping it from getting wet on wet ground, and it wouldn’t slide around in your car either. I give the case a 8/10, because at $29.99 you can’t expect the world. It’s got good feeling zippers, the material feels sturdy enough to last me a few years going back and forth to my friends houses with it. I’d have liked a little more space for the headset, but the case is fairly compact yet still holds everything for the console, two controllers and some games, I can’t really complain. Note: I purchased the CTA Digital case on Amazon but now (as of 12/10/14) it’s listed as unavailable. They also make a similar case for the Xbox 360 Slim, but I don’t think it would fit the Xbox One. Ep 6 – Destiny DLC, PlayStation Experience, and a Special Guest!